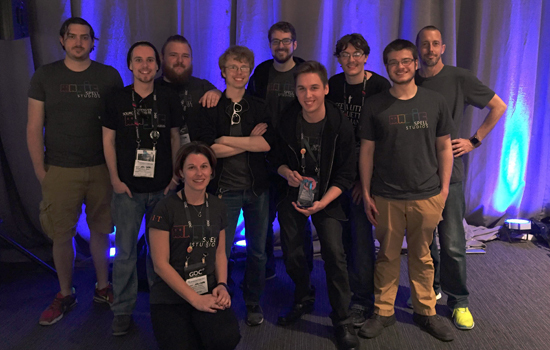 A class of RIT students won third place in the Best Visual Quality category of the 2016 Intel University Games Showcase for the video game Hack, Slash &amp; Backstab. The award was presented at the Game Developers Conference in San Francisco. A class of Rochester Institute of Technology students won third place in the Best Visual Quality category of the 2016 Intel University Games Showcase for the video game Hack, Slash & Backstab. The awards were presented March 17 as part of the 2016 Game Developers Conference in San Francisco. RIT will receive $2,500 in hardware from Intel for its third-place finish. The Intel University Games Showcase brings together the best student game projects from the top game developer academic programs in the United States. Student teams present their games live to a panel of judges made up of game industry luminaries and an audience of game industry professionals, as well as fellow students and faculty. Hack, Slash & Backstab was produced in residence at RIT in a studio course offered through the School of Interactive Games and Media, and the RIT Center for Media, Arts, Games, Interaction and Creativity (MAGIC). The original concept was created in 2015 by Andrew Phelps, founder and director of RIT’s MAGIC Center, and is published and maintained through MAGIC Spell Studios. In June, the game is expected to launch on Xbox One and Steam. Hack, Slash & Backstab is a two-to-four player couch co-op dungeon crawler that uses a game setting to seemingly reduce the stakes. Players work together as warrior, rogue, wizard and archer to survive a dangerous world, but only one player will be crowned the winner as betrayal and backstab become the tools of choice. To watch the trailer for the game, go to https://www.youtube.com/watch?v=7TqS_mPH7lY. The game was on display at the conference booth hosted by RIT’s MAGIC Spell Studios, the commercial, for-profit arm of the MAGIC Center. This was the second year MAGIC Spell Studios had a booth on the conference floor. Jayson Fitch, a fifth-year game design and development major from Fairport, N.Y., is the lead artist/asset creator on Hack, Slash & Backstab. In addition to the third-place win in the competition, RIT alumna Katie Tigue '15 (game design and development) and student Tristan Meere worked with the team from University of Texas/Austin and their game Roots of Sarkos, which took second in the Best Gameplay category. More than 100 RIT students, faculty, alumni and staff traveled to San Francisco this week to attend GDC, the world’s largest professional gaming industry event of the year. The conference, which ends today, is a key learning and networking opportunity for both aspiring and professional game developers. Students attending the event had access to hundreds of lectures, panels, tutorials and discussions by gaming industry leaders. GDC’s expo floor featured recruiters from virtually every major gaming company, providing developers with their first look at emerging industry software and technology.